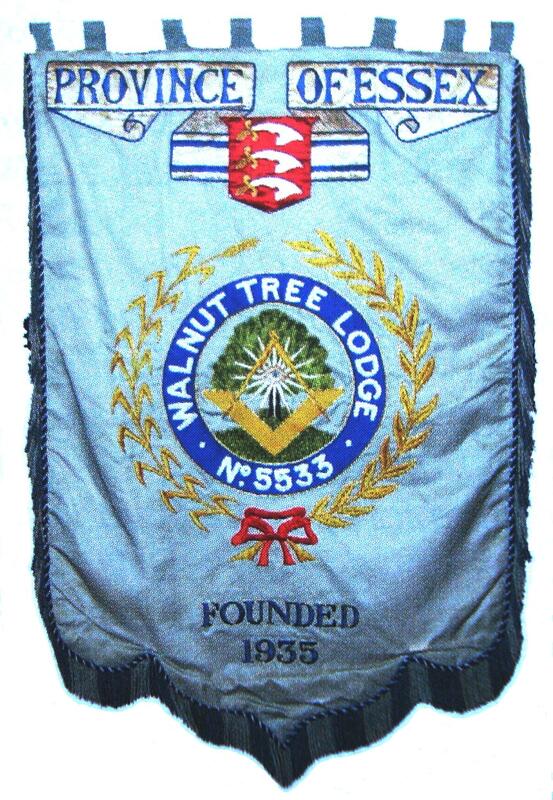 The Name ‘Walnut Tree’ was derived from the area in Dagenham where the idea of a new Lodge was first conceived by several Brethren, who came from London to commence the development of the LCC Estate at Becontree, in a field shown on the Tithe maps as the Walnut Tree Field, having a frontage on Green Lane. A temporary building was erected in this field as an office and the discussions on the formation of the Lodge took place there. They were joined by some Brethren from the Dagenham Council staff and others. Walnut Tree Lodge No. 5533 was consecrated by the RW Provincial Grand Master Brig. Gen. Sir Richard Colvin on the 15th October 1935 at the Lord Lambourne Masonic Temple, Romford. The Sponsoring Lodge was the Lodge of Old Friendship No. 3907. Bro. H. J. Goodwin, Provincial Grand Secretary, installed the First Master. The Meeting was well attended, the whole company numbering sixty-six, including thirty-nine visitors. The Lodge, at first, met at the Lord Lambourne Masonic Temple, Romford, but in 1941, when the Hall was taken over by the Government for use by the Forces, it moved to the Seven Kings Hotel, where it remained, under adverse conditions, until 1946. As there was only a piano available, one of the Brethren had an organ conveyed from his home for each meeting and collected the following day at his own expense. In February 1946 the Lodge was invited by Canon Elvin, PAGChap, Vicar of Saint Michael’s Gidea Park, to hold its meetings in the Parish Hall. Together with other Lodges in the Province, contributions were made towards the cost of furnishing but the Hall had been designed, by one of the Brethren, to be used for badminton and was very uncomfortable in winter. The Lodge eventually moved to Chingford Masonic Hall. A School of instruction had come into being prior to the consecration. Meetings were held at St. Peter’s Church Hall, Becontree. In 1938 the School was able to move to the more suitable accommodation at the Eastwood Club, Goodmayes. The conditions here where ideal but when, in the following year, the Civil Defence took possession, one of the Brethren offered the use of his large front room over his shop at Chadwell Heath, without charge, and always with a welcoming cup of cheer for those who had come straight from town. In 1945 the Lodge of instruction was formed and met at the Coopers Arms, Chadwell Heath. The Lodge of Instruction is currently held every Monday from September to June at 7:15 in the Brandon Groves Community Centre, Brandon Groves, South Ockendon, Essex. The Lodge Banner was presented to the Lodge in 1939. Owing to unforeseen circumstances, it was 1952 before it was dedicated and consecrated by the Asst. Prov. Grand Master, W. Bro. the Rev. Canon R. Stafford Morris, in an impressive ceremony at Chingford Masonic Hall. The Lodge Banner has recently been completely remade and is proudly displayed on the wall at The Square, Upminster. The Lodge currently meets at Upminster Masonic Hall on the 2nd Tuesdays in October, December and June, and the 3rd Tuesday in March.